We wish everyone from our family to yours a Happy Thanksgiving!!!! Make sure that you check out our website tomorrow so that you can start ordering up those Christmas tapes! And don't forget to order up gift certificates for all of those hard to find friends and family who you want to get hooked on 8-tracks!!!!! Our weather has turned a little cooler down here in Texas! Of course it's November and it should be getting cooler, but when you live in Texas, you never know what the weather will bring! I think the temps today were in the high 60's with a low expected tonight around 40. I really enjoed the picture Larry sent a few weeks ago. If you have one to send, let me know. Thanks again, Larry!!!! The list has been updated so take a look and let us know if you see anything you want to order - www.katestrackshack.com. We've added the Christmas tapes again this year. I've been seeing Christmas stuff out for several months now. I think I saw Christmas stuff out before I saw Halloween stuff! Also, again this year, we will be doing gift certificates. These are great especially if you know what type of music that someone special would like. Sorry for the delay in getting the list updated, but after we got back from Canada we had some computer problems and lost our emails, address books and some programs that helped me update my list. My wonderful husband recovered a lot of stuff but not the emails or address books. If you sent were on our subscriber list, please send us another email with "subscribe" in the Subject line so we can rebuild our list. Also, if you sent us emails about special tapes you were looking for, players, etc., please email us again so we can get back on track! We really had a great time in Canada and I'll be posting those picts as soon as I get them uploaded. 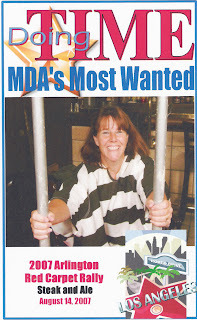 Thanks to everyone that helped me out by generously donating to this year's MDA Lockup. I was able to raise enough money to send at least one child to MDA camp this summer. I was told that this was this childs first time to be able to go to camp. I'm putting up the photo that was taken on the day of lockup. It was a lot of fun and helped raise money for a really good cause. Again, thanks to all those who gave without question! The MDA Lock-Up was a success! I was able to raise my bail with the help of great friends and family!!!!!!!! I was able to raise enough to send one little girl to camp! All those that participated have been given a little more time to raise extra money to help send other kids to camp or to other much needed services. You can also email me at dkgibson3@tx.rr.com if you have any other questions. I'll be posting my mug shot as soon as I can get my scanner working again!!!!! Thanks again to everyone who helped out!!!!!!!! We had one of our customers donate a bunch of 8 track tapes to help raise some extra money for the MDA Lock-Up that I will be doing in a few weeks. I added a couple of cases so that all of the tapes except one lot that has about 10-11 extra tapes not in a case. If you will go to our website you'll find the pages we've built for this event. There are 6 lots of tapes for sale. There are 3 lots that have a cases holding 24 tapes, 1 case holding 40 tapes and 2 that hold 30 tapes each (one of these has 10-11 extra tapes). We will be taking offers on each lot until next Sunday, the 12th of August. Those making the highest offers will get the tapes. S/H will be $8 on each case. If you win more than one lot, we'll combine the s/h. Email us if you have any questions. Remember that this is for a good cause so please help out if you can!!!!!!! Friendly Reminder - Time is Running Out!!!! Please Help If You Can!!!!!! This year, I have the honor and pleasure of participating in MDA's Arlington Telu 2007 to help "Jerry's Kids®". To reach my goal I need your help! I sincerely hope that you'll take the opportunity to support MDA. If you have any questions, please don't hesitate to call or e-mail me. Click here to visit my Participation Page. Just put up a new updated list at www.katestrackshack.com. We've added another new page - 4-tracks. You can check it out at http://www.katestrackshack.com/fourtracks.htm. Sale! Easy Listening tapes are 20% off - $.60 ea. One of our local tv celebrities, "The Why Guy", came out Monday to do a story on Kate's Track Shack and our daughter, Mary's AMC Pacer. It was a lot of fun!!!! We met Mike and his cameraman, Billy about a month ago when they did a story on our Amphicar for an upcoming Amphicar meet that we did on the 23rd of last month (story below). Mike is a great guy and when we mentioned we sold 8-tracks and had an AMC Pacer, he wanted to come out and do another story. Here is the url to see the video of the story. They even put up a link to the "Shack". We've just put up a new website that is the sister site to Kate's Track Shack. KTSP is the 8-track production company for Kate's Track Shack. KTSP's mission is to bring the 8-track into the 21st century. We have had bands and individuals contact us about putting their cd's or other media onto 8-track. Can it still be done you ask? Yes, and KTSP can do it for you! Saturday, June 23rd, we hosted our 1st Annual Lake Arlington Swim-In. 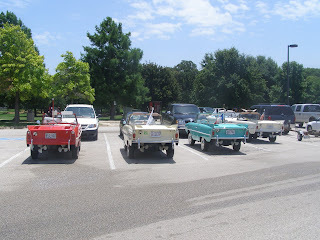 We had 5 Amphicars come from all around Texas. Ours, one from Mesquite, Westlake, Austin and even one from Houston! We have a great time. 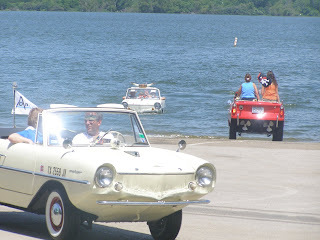 We gave out lots of Amphicar rides (free) and meet a lot of great people! I'm including a few pictures of the Swim-in. One of our local tv stations came out and did a short story on us. As soon as we get it copied over we'll post it. I'm still pretty new to this blogger thing so I haven't figured out to put a caption with each of the pictures. When I do, I'll fix this thing! The first picture is me driving some friends of my mother-in-law's around the lake. The second picture is of Dan in the foreground just before he takes someone out for a ride (yes, those are longhorns on the car in the water!). 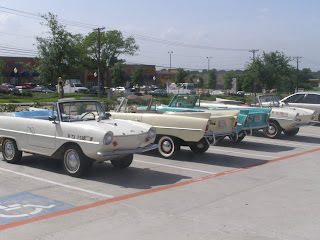 The third picture is of all the Amphicars in the parking lot while we had lunch. One of the cars is hiding on the other side. The fourth picture is Dan tubing one of our girls. And the last picture is of four of the cars at the car show we did at Bruster's Real Icecream after we finished up at the lake. The make wonderful icecream!!!! Gotta get off of this thing; we're about to get hit with a storm and I need to shut the computer down for a little bit. P.S. Thank you to Al & Debra Heath for taking these and the other great pics on Saturday! I hope all you Dads had a great Father's Day! We'd still like to hear from you guys with your 8-track stories. Email us at dkgibson3@tx.rr.com. I forgot to mention that this special discount is only good through 6-17-07! $$$New$$$ We have reduced the price on the Country/Western & Easy Listening Quads to $3.99. In honor of Father's Day, if you mention that you saw this posting, we'll give you an addional 10% off of your total order. As a reminder, if you're in the Dallas/Ft. 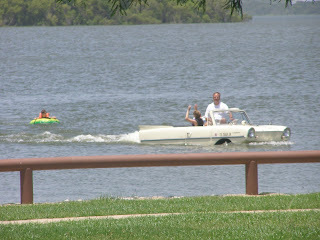 Worth area on June 23rd, we'll be hosting an Amphicar Swim-In at Lake Arlington around 10 am at the Arkansas Ln. ramp. We're expecting about 5 Amphicars to be there. 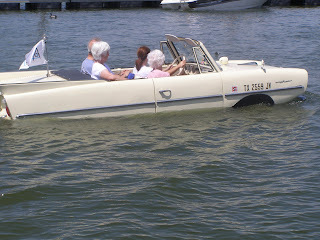 We'll be giving Amphicar rides as long as we hold out or the cars hold out!!! We've invited the media, so you may find yourself on tv! Then around 4:00 pm, we'll be heading off to Bruster's Ice Cream up on South Cooper for a mini car show and some good ice cream!!!!! Thanks for your patience!!!! I'm out of school and so are the kids for the summer! The list has finally been updated!!!!! www.katestrackshack.com. We've added a new page for car tapes and put carousels and cases on sale. Happy Mother's Day to all you mom's! So far, it's been a great day for me! In fact, it's been a great weekend!!!!! Friday night I finally graduated from college!!!!!! It only took about 5 years, but I did it!!!!! I'll post pictures when we get them back. Again, Happy Mother's Day to all you mom's!!!!!!! Let us know if you see any thing. You may need to rebookmark our website if you haven't done so. The old bookmark probably doesn't work anymore. It just needs to be "www.katestrackshack.com". Kate's Track Shack is back up!!!!! Hopefully we won't have this problem again!!! There is a new updated list out there - www.katestrackshack.com. Take a look and let us know if you see anything! I hear you New Englanders are still getting snow! We had snow flurries on Saturday here in sunny Texas! You guys stay warm up there!!!!!! We are aware that the website is down again! We've been talking with Road Runner again and it looks like they've screwed up again!!!! It seems we will have to manually migrate our website. I'm still waiting on a call from them. It looks like I'll have to call them back since my 24-48 wait is just about up to hear back from them. I apologize to everyone that has tried to get onto the site and can't! We're still here, just not being seen! I'm also working on testing more tapes to put on the list. I'll email those on the "Subscriber" list and let you know when the list is updated and the website is back up. If you aren't a "Subscriber" and want to be, just send us an email at dkgibson3@tx.rr.com and put "subscribe" in the Subject line. We'll send you out emails to let you know when the list has been updated and other important info. It looks like Road Runner has finished with the migration (at least for our website) and we're back up again!!!!!! Thanks to everyone who has notified us about our website being down. What a bummer! I've talked with our service provider and it seems that our website is being migrated from our old provider to the new one. They say that it shouldn't be down more than a day or two. I'm doing all I can to get it back up again as quickly as possible. Just put up a new list tonight! Be sure to check out our newest page at www.katestrackshack.com! It's Beatles & related tapes. We get lots of requests for these tapes so we decided to put up a special page for them. These tapes will be a little more than some of our other tapes, but they will be tuned-up with new pads/splices. 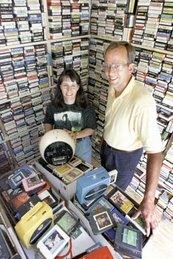 Tapes that are sealed, you decided if you want them tuned-up or not. If you were lucky enough to be off last week for Spring Break, hope you had a good time! We had some fun and got a lot of things done around the house the needed doing. The kids begged us to put up our pool, so Dan did that this weekend. They were brave enought to get into it tonight and go under water (water about 60 degrees maybe!). Still a little to cold for me!!!!! We also have some auctions on Ebay right now. Dan and I have some under seller name - dkgibson and our oldest daughter has some under seller name - katestrackshack. She is selling some quads to help put some money in her college fund and to pay for gas for her '76 Pacer! Just letting you know that a new list was put up last night! I think you'll find some good stuff this time around. Check it out at www.katestrackshack.com. I hate to make reminders like this, but sometimes it has to be done. If you place an order for tapes/supplies, etc. you need to pay for that order before placing another order. That's how most businesses work. We're not trying to be buttheads! Thanks for your understanding!!!!! Another heads up! Most of you have probably already heard that there is going to be another rate increase in postage! The lady at the post office said they weren't given an exact date, but probably would be sometime in May or June. We'll let you know how it will effect shipping costs once we know what the rate increases will be. I think 1st class on one oz will be raised to .41 cents. The Post Office would love to get rid of media mail, but I think there are too many of us out there that still use it quite a bit! Next week is Spring Break for me and the kids. Not sure if we'll go anywhere, but in case you email and we don't get back to you right away, that will be why.